Of the names of the 313 urban and semi-urban suburbs located to date in the city of Port Elizabeth and the neighbouring towns of Uitenhage and Despatch, an area known since 2001 as the Nelson Mandela Bay Municipality, 57 (18.2%) can be found in Scotland or are based on Scottish family names or Scottish words. Of course, some of the names are used in other parts of the British Isles as well, but at least 30 (9.6%) appear to have a unique connection with Scotland, or are readily identifiable with places in Scotland that are based on the same names. Picture of Port Elizabeth via Wikimedia. Alexander Park Industrial - Alexander is a Scottish family name, branches of the family being septs of Clans MacAlister, MacDonald or MacDonnell of Glengarry, although the name can also be found in England, for example, Alexander House in Kent. Balfour Heights - According to a letter from Lance Del Monte of Metroplan to the editor of The Herald, published on 29 October 2001, the suburb was named after Councillor Nomsi Balfour. Balfour is a Scottish surname, perhaps the most famous member of the family being Arthur Balfour, 1st Earl Balfour (1848-1930), Prime Minister of the United Kingdom from 1902 to 1905 and who issued the Balfour Declaration in 1917 stating Britain's support for the creation of a Jewish homeland in Palestine. Craig Bain - there is a Baincraig in Fife though this is not the origin of the name of the small township in central Port Elizabeth, which was named in 1940 after Councillor S. Craig Bain (Margaret Harradine, personal communication, 10 March 2006). Bain is a Scottish family name. Crockarts Hope Agricultural Holdings - According to the House of Names Heraldic website, Crockart is an Anglicisation of the Gaelic surname MacRiociard, 'son of Richard'. This surname is an uncommon one, the 1891 census of Great Britain showing only two families with this name, both in southern England. Ferguson - while there are no places in Scotland called Ferguson as such, this is definitely a Scottish name. The Ferguson clan has numerous branches, the name meaning 'first choice' in Gaelic. The Ferguson tartan is shown here. Margaret Harradine, in a personal communication dated 26 April 2006, stated that Dr Duncan Ferguson was the City's Medical Officer of Health for many years. Gelvandale and Gelvan Park - there is a place called Gelvan in Perth & Kinross. These suburbs were named in honour of Councillor C.M.S. Gelvan (Raper, 1989). It is not known, however, whether Councillor Gelvan was of Scottish descent. Glendinningvale (Glendinning, and Glendinning Burn, Cleuch and Heights in Dumfries & Galloway) also Glendinningrigg just over the border in Cumbria. John James (Jack) Glendinning was a City Councillor and Mayor in 1944/45. He came from Newcastle-upon-Tyne, though his name is obviously Scottish (Margaret Harradine, personal communication, 10 March 2006). Glenroy Park - Glenroy is a valley in Lochaber, a scenic area in the west Highlands of Scotland. Greenshields Park - there is a place called Greenshields in South Lanarkshire. The suburb takes its name from the property called "Greenshields". The property was given its name by John Greenshields Paterson, a grandson of the Reverend Thomas Paterson, a Congregational minister from Edinburgh, whose wife's maiden name was Greenshields (Margaret Harradine, personal communication, 21 April 2006). Helenvale - "Helenvale is named after a Miss H Galloway of the Municipality's Housing Dept." (Margaret Harradine, personal communication, 17 December 2009). Galloway is a Scottish family name. Hoy (one of the Orkney Islands) - In a personal communication received from Margaret Harradine on 17 December 2009, it was stated that Thomas Hoy was a Scottish businessman who came to South Africa in 1881. 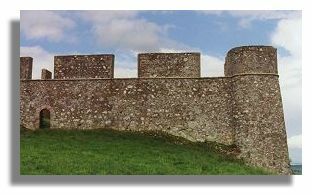 Humewood and Humerail - there is a Hume in the Scottish Borders, as well as Humehall, Hume Castle (pictured here), Hume Craigs, Hume Mill and Hume Orchard; also Humesett and Humeston in Ayrshire. Humewood is Port Elizabeth's premier seaside suburb. It was established in 1860 and was named after William Hume, Member of the Legislative Assembly and Chairman of the Harbour Board, which owned the land (Margaret Harradine, personal communication, 21 April 2006). In the case of Humerail, the name reflects the practice of the former Railway Authorities of naming railway property after the suburb near which it is located together with the word 'rail' (see Belrail in the Rampant Scotland article on Cape Town as another example involving a Scottish surname). Lindsay Road Industrial - there is a place called Lindsayfield in East Kilbride, South Lanarkshire. Lindsay is a Scottish family name, first found in Lanarkshire (House of Names) and derived ultimately from Lindsey, a region of Lincolnshire in eastern England (Ancestry.com). The surname Lindsay is still borne by the Earls of Crawford. The Port Elizabeth suburb was named after GK Lindsay, one of the first businessmen to operate in the area (Margaret Harradine, personal communication, 28 February 2013). Linkside - The name of this suburb is descriptive of its location along the southern boundary of the Port Elizabeth Golf Course. Linkside does not seem to occur as a place name in Scotland, but the word 'links' is a Scots word meaning 'undulating, sandy ground near a shore' or a golf course on such land. McLeanville - based on a Scottish family name; there is a McLean Museum in Greenock, Inverclyde. Laid out in 1928, the suburb was named after Jas. McLean, a former mayor of Port Elizabeth (Raper, 1989, p. 312). McNaughton - an ancient Scottish family name meaning 'son of Nechtan' ('the pure one') in Gaelic (Scarlett, 1975, p. 123). No information has been found on the individual whose name was given to this Uitenhage suburb. Morningside (Dumfries & Galloway, City of Edinburgh, North Lanarkshire and Perth & Kinross) - see the illustration above for a typical Morningside, Edinburgh residence. Morningside is one of the most commonly recurring Scottish place names in cities around the world, especially in South Africa and the USA. 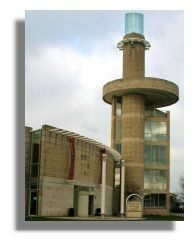 Motherwell (a large town in South Lanarkshire - that's its Heritage Centre shown here). Motherwell is recorded on earlier maps of Port Elizabeth as being the name of a farm off the main road between Coega and Uitenhage (see, for example, The Reader's Digest Atlas of Southern Africa, 1984, p. 94). Motherwell was one of three farms in the area that had Scottish names, the other two being Paisley and Kelvin Grove. All three of these names are from the Greater Glasgow area. Today, the Port Elizabeth suburb of Motherwell forms part of the sprawling complex of townships in the far north of the city that have sprung up in recent years to accommodate the mass migration of black people from the rural hinterland. Murray Park Agricultural Holdings - Murray is one of the best known Scottish family names derived from the name of the area (Moray) in which the Pictish founder of the clan was granted land (Scarlett, 1975, p. 139). Examples of places in Scotland based on this name include Murray's Hill (Perth & Kinross), Murrayfield (Edinburgh), Murraythwaite (Dumfries & Galloway) and many others. The name has also travelled to England, e.g., Murray's Rock in Devon and is claimed as an Irish name as well. Neave Industrial Township - there is a Neave Island on the north coast of Scotland opposite the village of Skerray in the former county of Sutherland; the island is also known as Coomb Island. This suburb was named for John Sime Neave, MBE, Mayor of Port Elizabeth 1946-47, whose ancestors were Scottish. The Neave family was originally from Forfar, Scotland, and John Sime's great-grandfather was David Neave, the town architect of Dundee, Scotland (information supplied by Eleanor Rayl, Indianapolis, USA, 30 January 2007). Normanville - Norman is said to be a Scottish family name of Norse origin, from the Viking 'noromenn' (men from the north). Of course, the name of this suburb may simply refer to the personal name Norman. Red Braes - there is a place called Redbraes in the Orkney Islands, brae being a Scots word for a hill or hill slope. Information on the reason for the name of this suburb in Despatch has not been found. Rowallan Park (Rowallan and Rowallan Castle in East Ayrshire). Most of the streets and roads in the eastern section of this suburb have Scottish names (Angus, Carrick, Dundee, Falkirk, Fife, Greenock, Kinross, Lothian, Peebles, Renfrew and Stirling). In a communication received on 28 February 2013 from Margaret Harradine it was stated that Rowallan Park was named by city councillor Marchant Davies, probably after Lord Rowallan, Chief Scout of the British Commonwealth and Empire. Thomas Godfrey Polson Corbett, 2nd Baron Rowallan (1895-1977) was born in Chelsea, London, raised in London and on the family's Scottish estate, Rowallan Castle, in Kilmarnock, Ayrshire and died at Rowallan Castle. He served as Chief Scout of the British Commonwealth and Empire between 1945 and 1959 and Governor of Tasmania between 1959 and 1963 before retiring to Rowallan Castle. Scout camp sites in Riddell's Creek north of Melbourne, Australia, Wrexham in Wales and Nairobi in Kenya are named in honour of Lord Rowallan, as was a Britannia Class Locomotive (Wikipedia article on Thomas Corbett, 2nd Baron Rowallan, retrieved in February 2013). One wonders whether a second, but related, inspiration for the name of the Port Elizabeth suburb could have been the Rowallan Castle, a Union Castle liner which was in service between South Africa and Britain from 1939 to 1971 and which would have called in regularly at Port Elizabeth. Scotstoun (City of Glasgow). As explained by Margaret Harradine in a personal communication dated 21 April 2006, Scotstoun was named in 1929/30 after the Mayor of Port Elizabeth, James Scott from Dunoon. This neighbourhood, in Mill Park Township, was originally to have been called "Scottville"; it is a small area of around 45 lots and James Scott lived nearby. Struandale - there is a Struan in Angus, Argyll & Bute, Highland and Perth & Kinross. Struan is also a Scottish family name related to Strachan and Straughan. Margaret Harradine, in a personal communication dated 28 February 2013, stated that Struandale was named after City Councillor Struan Robertson, who served as Mayor of Port Elizabeth in 1956 and 1957. Robertson is a Scottish surname. Stuart - a Scottish family name; there is a Stuartfield in Aberdeenshire based on this name. Stuart or its more common form Stewart is strongly associated with Scottish royalty, the name being derived from the office of High Steward of Scotland. 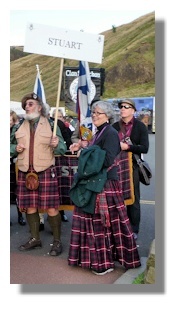 The illustration here is of the Stewart/Stuart clan representatives at the Highland Gathering in Edinburgh in 2009. Taybank (Perth & Kinross). The Port Elizabeth suburb took its name from a portion of the farm on which it was laid out (Margaret Harradine, personal communication, 28 February 2013). Tiryville - According to the House of Names Heraldic website, Tiry is a Scottish family name first recorded in Argyllshire and related to MacIntyre. Black (1996), the authority on Scottish family names, makes no mention of Tiry, nor does the Ancestry.com website but if the 'House of Names' information is correct, then the origin of Tiry as a family name is occupational, from the Gaelic word for a carpenter. Broadwood (South Ayrshire) also in England. Cleary Park - there is a Clearymuir in Aberdeenshire, the only occurrence of the name Cleary on the British mainland. Cleary is an Irish family name, however, (commonly anglicised as Clark), which suggests that the origin of the name of this suburb might not necessarily be Scottish. The suburb (formerly Cleary Estate) was named after D.J. Cleary, Director of Housing for the Municipality of Port Elizabeth, who developed this part of the original Bethelsdorp lands (Margaret Harradine, personal communication, 21 April, 2006). Florida (Scottish Borders, near Castleton) but more probably of American origin or a borrowing from Johannesburg. Gerald Smith - Smith is the most common surname in both Scotland (where there is a family tartan) and England; it is also the 5th most common surname in Ireland and 13th in Wales. No information has been found on the identity of the person whose name was bestowed on this squatter camp in Uitenhage. Glenhaven - there are places simply called Glen in Dumfries & Galloway, East Ayrshire, North Ayrshire, Orkney Islands and Shetland Islands, as well as two places in Ireland. In addition, there are hundreds of places in both Scotland and Ireland and a few in England and Wales with Glen as an element in the name. Glen means 'valley' in Gaelic. Greenacres (Scottish Borders) but is also used all over England. Hillside (Aberdeenshire, Angus, City of Edinburgh, Dumfries & Galloway, Fife, Inverclyde, Moray, Orkney Islands, Perth & Kinross, Shetland Islands and South Lanarkshire) but the name is used just as frequently in England, sometimes spelt Hill Side, and is also found in Wales. Linton Grange (Linton in the Orkney Islands and Scottish Borders; also Linton Burnfoot and Linton Hill in the Scottish Borders, Linton Court in Fife, and Linton House in Aberdeenshire) but Linton is found even more commonly in English place names. As a surname, Linton is also just as likely to be English as Scottish. The suburb was laid out in 1953 and, according to Raper (1989), was named after a former mayor of Port Elizabeth, Archibald Linton, whose ancestry has not been recorded. Marchantdale - Marchant is said to be a Scottish family name of Norman origin, from the Old French word for a merchant. It is, however, also an English family name. One wonders whether Marchantdale was named in honour of City Councillor Marchant Davies (see Rowallan Park above), in which event the link is more likely to be Welsh or possibly English rather than Scottish. Mount Pleasant (Aberdeenshire, Argyll & Bute, Scottish Borders, Dumfries & Galloway, East Ayrshire, Fife, Highland, Moray and the Orkney Islands) also all over England, Ireland and Wales, as well as Australia, Canada and the USA it would seem. Information on the reason for the name of the Port Elizabeth suburb has not been found, Raper (1989, p. 364) simply stating the following: "Laid out in 1904, the name refers to its pleasant situation." Parkside (Aberdeenshire, Angus, North Lanarkshire and Perth & Kinross) also in England and Wales. Sea View (Highland, spelt Seaview) also two places in England, spelt Seaview. Springfield (Argyll & Bute, Dumfries & Galloway, Fife, Highland and Perth & Kinross) also in England and Wales. 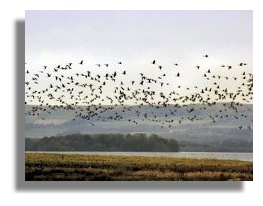 Vanes Estate - there is a wildlife centre and bird sanctuary at Vane Farm on Loch Leven in Perth & Kinross. However, there are also two places called Vane Court in south-east England, while Vanes or Vane is an alternative form of the English surname of Fayne or the Welsh surname of Vaughan. Victoria Park (City of Glasgow) also all over England. This neighbourhood, like its namesakes in England and Scotland, was presumably named for Queen Victoria. West End (South Lanarkshire) but found even more commonly in England and to a lesser extent in Wales. Woodlands (Aberdeenshire, Argyll & Bute, Borders, Dumfries & Galloway, Fife, Highland, Perth & Kinross and South Lanarkshire) also all over England and is found in Ireland and Wales as well. There appear to be two places called Woodlands in the Port Elizabeth metropolitan area, one in the western suburbs and the other in Uitenhage. A final category of suburban names comprises places that can be found in Scotland, or that are based on Scottish family names but which, in Port Elizabeth's case, definitely or most probably have no connection with Scotland. Barris Township - there is a Barrisdale in Highland but there is also a Barris Hill in Pembrokeshire, Wales. Margaret Harradine, in a personal communication, speculates that the name of this township may be attributed to the Barris family, one of whose members was a City Councillor from 1955. The Barris family is Jewish, and "assuming they are like everyone else in our present Jewish Community, they came from one of the Eastern European countries such as Latvia, Lithuania etc and changed their surname at some point." (Margaret Harradine, personal communication, 21 April, 2006). According to the House of Names Heraldic website, Barris is a German surname. Forest Hill (a hill in Dumfries & Galloway) but the name occurs more widely in England, including the south London suburb. The origin of the name of this Port Elizabeth suburb is far more likely to be descriptive of the fact that it adjoins a Government Forestry Reserve (Margaret Harradine, personal communication, 17 December 2009). Glenhurd - although there is no known place in Scotland with this name, the House of Names Heraldic website suggests that Hurd is a variant spelling of the Scottish surname of Herd. The Ancestry.com website, on the other hand, considers Hurd to be a variant of the English family name Heard and supplies census information from the 1890s to suggest that the surname Hurd was found far more commonly in England than in Scotland. In a communication received from Lawrence Caldicott, Auckland, New Zealand, on 29 January 2009 is was suggested that the Port Elizabeth suburb could have been named for Herbert Hurd, who also has a primary school named after him in the neighbouring suburb of Newton Park. Herbert Hurd was a young Englishman who immigrated to Port Elizabeth from London in the early 1890s and who became a successful businessman and landowner. The above explanation of the origin of the suburb's name has subsequently been confirmed in a communication received from Margaret Harradine on 23 February 2013, in which it was also stated that Sydney Herbert Hurd was co-director with George Newton of the Fairview Suburban Estate Company (see Newton Park below). Hunters Retreat - Hunter occurs in many place names throughout Scotland and is also a frequently found surname - that's the clan tartan shown here. The list includes Aberdeenshire (Hunter's Hill and Lodge), Angus (Hunter's Path and Hunters Hill), Argyll & Bute (Hunter's Quay), Scottish Borders (Hunter Hill and Huntershall), Dumfries & Galloway (Hunter House, Hunter's Gate, Hunterheck), East Ayrshire (Hunter's Meadow, Hunterston), North Ayrshire (Hunterston, Hunterston House, Hunterston Sands), Perth & Kinross (Hunterhall) and South Lanarkshire (Hunterlees). Hunter is found even more commonly throughout England. In a personal communication from Margaret Harradine on 17 December 2009 it was stated that Hunter's Retreat was the name of an inn on the Cape Road on a piece of farmland, the name dating back to the mid-1800s. Mill Park (Argyll & Bute) also in Cornwall, England. The origin of the name of this suburb is neither Scottish nor English, however. "Mill Park includes land once known as the Mill Property from an old windmill built by a German millwright and farmer in the late 1820s." (Margaret Harradine, personal communication, 21 April, 2006). Mountain View (Scottish Borders) also in Cumbria, England. The name of this Uitenhage suburb is probably purely descriptive of its commanding view of one of the nearby mountain ranges. Newton Park (Argyll & Bute) also two places in England and one in Wales. The Port Elizabeth suburb was named for George Newton, property developer. George Newton and his business partner Sydney Herbert Hurd purchased a portion of land from the Parkin family in 1901, the first plots being sold to the public in 1902 through their company, the Fairview Suburban Estate Company. Streets in the suburb were named after the Company's shareholders and the neighbouring suburb of Glenhurd was named after George Newton's business partner (see Glenhurd above). George Newton's ancestry was English; his father, Isaac, came to the Cape in 1849 from Portland in Dorset (Margaret Harradine, personal communications, 23 February and 27 February 2013). Redhouse - there are several villages in Scotland with this descriptive name, in Aberdeenshire, Argyll & Bute, Dumfries & Galloway, East Lothian and Fife. The name is also used in England but less frequently than in Scotland. The Port Elizabeth suburb has no connection with any of the places in Scotland or England. "In the 1870s there was a red-painted house next to the Zwartkops River, rented by fishermen. At the time this part of the river was being developed as a resort and the name Redhouse stuck instead of the planned "Henley Reach"." (Margaret Harradine, personal communication, 25 February 2013). South End (Argyll & Bute) also in England. Since this suburb is at the southern end of the city centre, the name would appear to be purely descriptive of its geographical situation (the opposite end of the city centre is similarly called North End, a name not found as the name of a community in Scotland). Sadly, reminders of the strong links that were forged between Port Elizabeth and Scotland during the nineteenth and the first half of the twentieth centuries are being eroded as names such as Craig Bain and Scotstoun, although still recorded on some maps, become disused. Most Port Elizabethans would look at you blankly if you asked for directions on how to get to Scotstoun, including those who may actually live in the neighbourhood, since 'home' for them has always been Mill Park. There are 11 metropolitan areas in South Africa with a population of half a million or more. Of these, the Port Elizabeth-Uitenhage complex seems to share the distinction, along with East London, of having the highest proportion of suburban names with Scottish connections. This is perhaps understandable since South Africa's fifth largest city owes its very existence to the 4,000 British immigrants who landed at Algoa Bay in 1820 and to their descendants and later British immigrants. 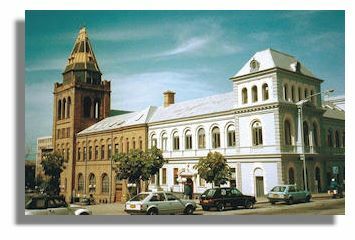 The Scots certainly played a central part in the establishment of Port Elizabeth and in its subsequent growth as a commercial and industrial city. Margaret Harradine, the former Africana Librarian at the Port Elizabeth Main Library, states that "Port Elizabeth had a large Scottish population, virtually all coming from the Edinburgh area and counties such as Angus, Aberdeen and Fife. The Scots were successful here and seem simply to have been good at what they did and to have been intelligent, educated and industrious." (Margaret Harradine, personal communication, 17 December 2009). Collins Gem Scots Dictionary (2000). (HarperCollins Publishers, Glasgow and London). Harradine, Margaret (1995). Port Elizabeth: A Social Chronicle to the End of 1945. (E.H. Walton Packaging (Pty) Ltd, Port Elizabeth). Hockly, Harold E. (1957). The Story of the British Settlers of 1820 in South Africa (Second Edition). (Juta & Co., Limited, Cape Town). The House of Names Heraldic website. Port Elizabeth Street Plan (MapStudio, 1996). Use the "Back" button on your browser or click here to return to the Index of Scottish Place Names.